The Eastern Cape and the artist George Pemba are synonymous. "He has lovingly recorded its landscapes and people, both urban and rural," writes Sarah Huddleston in Against All Odds: George Pemba - His Life and Works. Yet Pemba, recognised today as a pioneer of black art and a major South African artist, toiled for much of his life in the "wilderness" of obscurity and a lack of formal training. He persisted, learning through trial, error and determination. "One teacher ... used to punish me for drawing during school hours in spite of the fact that I had done my other work and that satisfactorily," Pemba writes in his diaries. Huddleston recounts that at school, Pemba's stammer and lack of attention in class earned him the label "the idiot of Korsten" by a white school inspector. Upset by the label, his father, Titus, saw one of his son's drawings and bought him a box of watercolour paints, paper and brushes. In Standard Six, Pemba won a Grey Scholarship to Paterson Secondary School in Port Elizabeth, where a teacher encouraged him in his art. In a biographical sketch in the Pemba retrospective exhibition catalogue (1996), author Barry Feinberg writes that the artist probably first earned money from his paintings when he bought admission tickets to a "bioscope" (cinema) in Bethelsdorp, where the family lived in the 1920s, with money he'd earned from drawing portraits of film stars. The first exhibition of his work - two portraits - took place at the Feathermarket Hall, Port Elizabeth, in 1928 when he was 16. His work "received enthusiastic public acclaim". Titus Pemba also showed his son's work to his employers at Cuthberts shoe retailers, who commissioned the youngster to turn photographs into watercolour paintings. Pemba's father was killed in a motorcycle accident in 1928. (The watercolour Funeral Procession is said to depict the family's grief). His mother, Rebecca, then had to walk more than 30km a day to do laundry to support her family. Pemba focused on becoming a teacher to earn money for the family, and went to Lovedale College in Alice in 1931. But soon a burst appendix landed him in Victoria Hospital, where he drew doctors, nurses and patients. One of these patients, a man called Ngcobo, told Pemba: "But I never thought you could draw souls." The drawing of Ngcobo was taken to Ethel Smythe, who taught art at the nearby Fort Hare University. She offered to teach Pemba for five weeks. Pemba later graduated from Lovedale College. He formed a long-standing association with the Rev Robert Shepherd of Lovedale Press, who commissioned Pemba to illustrate several works. Pemba taught at a school in King William's Town from 1935. Shepherd, meanwhile, arranged a bursary for Pemba to study art with Professor Austin Winter Moore at Rhodes University for four months as an "external student", a way around the racial admission policies in education then. I also have to thank myself for holding on with the hope that one day the sun will also shine on me. In 1937, Winter Moore entered Pemba's work in the May Esther Bedford Art Competition, the very first exhibition for black South Africans. Pemba won first prize and Gerard Sekoto was runner-up. In 1938 Pemba moved back to New Brighton. He left teaching to take up a better-paid job as messenger of the Native Commissioner's Court, and then as a rent collector for the Township Administration. He hated his job, much preferring his art. "I had no idea that people could live by art - I did it more for my own entertainment," Feinberg quotes Pemba as saying. In the early 1940s, a "wealthy lady" who asked Pemba to paint her portrait suggested he go to Cape Town for a two-week art course. Although he left the course early - "I could not see my progress at this school" - he did meet Sekoto on this trip. Sekoto "recommended that I revert to oil paintings because watercolours were an English medium. South Africans prefer solid paint and effective colour," Pemba writes in his diaries. "He also encouraged me to go independent... I would be able to devote all my time to art." Pemba writes that Sekoto "liked his liquor and told me that when he had over-indulged in liquor and suffered from its effects the following day, he would paint a masterpiece". Pemba himself waged a long battle against alcohol. It was his demon, which lost him at least one potentially lucrative commission. At one point, after trying in vain to stop drinking, he writes of his "serious choice - either to be an alcoholic or a successful artist". He offers some insight into his alcoholism: "The history of my drinking started [with being persuaded to go] into a coloured bar where I had a glass of beer. I passed for coloured because of my fair complexion and being fluent in Afrikaans. Those were the days of prohibition." Later, he was "part of an 'elite' class in which inebriation was the order of the day. I was at the top of the world in my drunken stupor". Many of the "elite" drank themselves to death, he adds. To "get rid of liquor", he joined a "faith-healing" church. "I felt addiction to liquor was a disease... The church gave me the confidence which I lacked, and in a short time I was completely cured." Sekoto's advice to concentrate on his art was later reinforced by one of the few black people in art education, John Koenakeefe Mohl. Pemba did not give up his "regular" job immediately, but he did spread his wings as an artist. In 1944, he obtained a £50 loan from the Bantu Welfare Trust and was awarded a £25 grant. "Please give me a chance of seeing South Africa, of living for a short while with my people in the plains and bush of my country," he wrote in his application to the trust. The funds paid for his "grand tour" - the "adventure of my life", he called it. First, he travelled to Johannesburg. Disappointed, he found "only the ardent wish to make money". Pemba went to Durban and Mthatha, but was most fulfilled in Basotholand (Lesotho). He later said he regarded his portraits of Basotho women in national dress as among his best pictures. He returned to Port Elizabeth and his job in the rent office, becoming "increasingly frustrated because it did not allow him time to paint", says Feinberg. Two successful exhibitions took place in 1945. First was the annual exhibition of the Society of Arts and Crafts in Port Elizabeth. The Eastern Province Herald newspaper called Pemba "easily this year's 'Best Seller'". Pemba wrote that his "work sold like hot cakes". Next was the Durban International Club exhibition of black artists. The organisers told Pemba all his pictures had been sold within a few hours of the opening and "we could have sold them many times over and trebled the money". 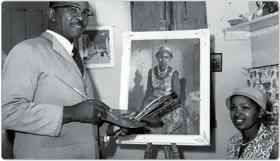 In 1948, Pemba held his first solo exhibition at the Old Mutual Arcade in Port Elizabeth. That year, the apartheid government came to power, and Pemba considered leaving the country. Friends, however, "said I'd be influenced by communists, and then be frustrated when I got back". He stayed, becoming one of the few black artists of the time not to go abroad. He did, however, become deeply involved in political activism, alongside his good friends ANC leaders Raymond Mhlaba and Govan Mbeki. Pemba produced cartoons for the newspaper Isizwe (The Nation), put together by Mhlaba, Mbeki and other leaders. Eventually, "in 1952, I resigned from the Administration", he writes in his diaries. At the same time, he "succeeded in getting a licensed shop", a spaza called Gabby's Store in Boastville, New Brighton. He devoted himself to painting, which earned him a sporadic income. He wrote two plays, Ntsikana, the Xhosa Prophet, which was performed "to enthusiastic acclaim" in New Brighton, according to Huddleston, and The Story of Nongqawuse, the Xhosa prophet who had encouraged her people to kill their cattle in the mid-1800s. Pemba also painted his "epic picture" of Nongqawuse at this time. On November 17 1968, his brother Jimmy died. "I could not paint at all," Pemba writes. "I was in the wilderness so ... in order not to forget my art, I started a masterpiece in poster colour on a whole wall of my sitting room... The masterpiece was by Degas and depicted an orchestra in a pit." The work is no longer on the sitting-room wall. Pemba had eight children of his own, but the death of his brother and the divorce of his sister left him and his wife, Eunice, with 20 children to care for. It seemed he would never be able to paint full time again. But in 1969, he received in the mail an unsolicited envelope of money from the International Defence & Aid Fund, an organisation in the UK that supported victims of apartheid. For the first time Pemba was able to feed his family and buy art supplies on a regular basis. The financial support continued for some 20 years. On September 6 1975, the Eastern Province Herald reported on Pemba's one-man exhibition at the Little Gallery of about 50 paintings recording "the urbanisation of the African people with an intimacy of knowledge which few whites could possess". His "red-letter day" came in January 1979 when Fort Hare awarded him an honorary degree. This was Pemba's first official recognition. For most of his life his art had not been recognised by the establishment - and he continued to work largely in obscurity even after this. "I have almost throughout my life been in the wilderness," he writes in an undated entry in his diary. Draw from life and imagination. Try to interpret your daily life and surroundings. Keep away from strong drink and other unhealthy distractions. Feinberg says the first sign of broader recognition, and national attention, came only in 1991 with a major exhibition at the Everard Read Gallery in Johannesburg. A German art dealer, Hans Weber, had bought the entire stock from Pemba's studio, paying R4 000 for 178 paintings. Weber sold this collection to the gallery and Pemba noted individual works were on sale for more than he'd been paid for the entire collection. Other exhibitions followed, including a highly successful exhibition at Port Elizabeth's Highbury Gallery in June 1993 of watercolours from the 1930s and 1940s. Feinberg says it "reinforced Pemba's burgeoning reputation as a major South African painter". In notes for a speech, dated June 25 1991, Pemba thanks his supporters, and adds: "I also have to thank myself for holding on with the hope that one day the sun will also shine on me." Deprived of formal art education himself, Pemba was passionate about ensuring township artists had these opportunities. This is a strong theme in his diaries. For instance, he writes on September 30 1982 that he had been teaching art in the city centre, "but felt it better to teach nearer home for the convenience of township youth and adults". This was ended by "the current unrest" in New Brighton. In notes for a speech on February 2 1985, Pemba advises young artists: "Draw from life and imagination. Try to interpret your daily life and surroundings. Keep away from strong drink and other unhealthy distractions." Pemba continued painting until his death at the age of 89 in 2001. One of the last things he did was to support the endeavour of his grandson Bonakele "Bobo" Pemba, who set up the George Pemba Art Foundation. It aims, among other things, to provide formal training and education to young artists in New Brighton. The foundation, with the support of the national Department of Arts and Culture, operates from Pemba's home, 28 Ferguson Road. On October 29, 2004, the President posthumously awarded George Pemba the Order of Ikhamanga for his pioneering and exceptional contribution to the development of the art of painting and literature.